35 years of providing incredible gems to traders, manufacturers, collectors, museums, and the finest stores. Traveling the globe uncovering beautiful gems. Large and small, rare and exotic, bringing them home for you. Technical expertise from the gem laboratory, to the gem mines, to you. Providing experience and knowledge, the foundations of trust. In 2003 I established Jeffrey Bilgore LLC for a more personal Relationship with my clients and gems. Working directly with clients and craftsman to develop commissioned creations. One that the owner reaches for with a smile. "All the passion and knowledge is shared in every piece with every client." My love of gems drives every effort. The thrill of discovering each natural wonder is the spark, this energy ignites the design. Each gem evolves into a jeweled creation reflecting my passion for natures beauty. "The numerous AGTA Spectrum and Cutting Edge Awards have not come without due. Jeff has spent the time and effort learning the industry from the ground up as a young man and now the acclaim and prestige associated with his name are certainly earned. I am proud to know him, his passion is unsurpassed in the industry. Here at Eiseman Jewels we have worked with Jeff for nearly 30 years, since his days with Oscar Heyman & Brothers. He has only gotten better. His integrity, designs, quality, and value are simply the best." Second to study and see if the inner beauty is fully released. These gemstones are from 10-30 carats. Each gem leads and inspires its design. A range of colors showing the journey from rough to faceted. Each stone has its own presence, its own personality. Burmese Spinels from 2-5 carats each with rough crystals. Red Spinels are framed by classic design reminiscent of the glory days of the house of Cartier, but updated with a modern accent. Fabricated by hand with the old world engraving and milgrain accents. The center octagon cut of this amazing Tanzanian spinel is a cut from from the high mark of Parisan lapidary artists(1920-1950). Setting this gem east-west across the finger adds a modern touch. A creation with the elegance of the past and the beauty of today. The earrings are a delicate compliment, beautiful and easily worn night or day. Presented in sapphire rings Padparascha, blue, yellow, pink natural in every way. All man has done with natures crystalline wonders, is find them, facet them, and fabricate them. With these two Australian Black Opal gems. The wearer has a rainbow on their finger whenever they wish. 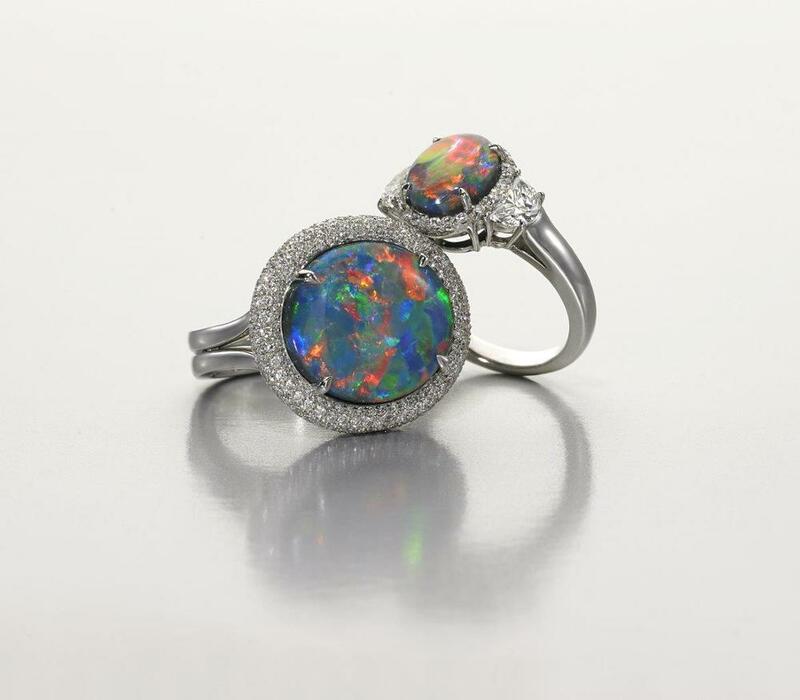 A gem opal from Lightening Ridge is like no other gem. Each gemstone uniquely presents the best of every gem, all in one stone. When searching for gems the flash of a great opal can catch my eye and stop me in my tracks. The only question is what is the best design to show its magnificence. These two rings balance excellence in design, fabrication, and true gems. This Amazing 30ct Black Opal mirrors the palatte's of Monet, Cezanne and Van Gough showing that, in fine opal, mother nature's palette is far superior. The red, green, and blue flashes are intense wisps that look like painted clouds of a summer sky. The partial gold and diamond frame delicately wraps this gem in a pendant of simple beauty.